Police have appealed to anyone with information about a Ferndown shed burglary, theft of a statue in Verwood or a spate of dingy and outboard motor thefts in Lymington. Following a spate of outboard motor thefts in Lymington, a shed burglary in Ferndown and theft of statute in Verwood, police are appealing for anyone with information to get in touch. The shed burglary in Ferndown happened overnight between Thursday 20 April and Friday 21 April 2017 at an address on Ringwood Road. A chain saw, leaf blower, hedge trimmer and an engine were stolen. CCTV images have been released of the suspects. If you know who these men are get in touch with the police quoting occurrence number 55170058243. 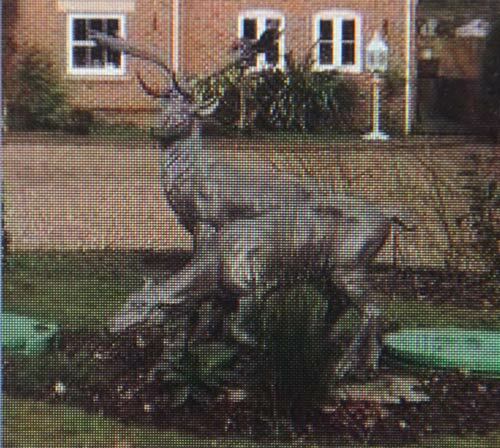 In Verwood it was reported that a life-size bronze deer and fawn statue worth around £5,000 was stolen from an address on Doe Lane at around 9pm on Sunday 19 March 2017. Dorset Police say the statue is one of only two ever made and has great sentimental value to the owners. A picture has been released. Police Constable Fay Sweeting said: “I have now received information to suggest that the statue may have been transported to Wiltshire. It is believed that the vehicle which was used to carry the statue was also used to tow a caravan, which we think was stolen. It is thought to be a 2011 Sterling Celebration four-berth caravan. “I am appealing to anyone who has seen this statue or the caravan for sale in suspicious circumstances since the time of the incident either in Dorset or Wiltshire, or has purchased the items in good faith, to please get in touch.” The incident number is 55170040536. In Hampshire boat owners are being urged to be vigilant following a spate of thefts in Lymington. Officers from Hampshire Constabulary’s Marine Unit are investigating a series of eight dinghy and outboard motor thefts between 23 April and 8 May. The majority of thefts have taken place at the Royal Lymington Yacht Club and Bath Road, Lymington. A total of five dinghies and seven outboard motors have been stolen. He added: “We would like to take this opportunity to remind boat owners to record all serial and engine numbers because this helps us to reunite any stolen items to their rightful owners. Anyone with information or who sees anything suspicious should call PC Arnold on 101. Anyone with information about the Dorset crimes is asked to contact Dorset Police at www.dorset.police.uk, via email 101@dorset.pnn.police.uk or by calling 101. Alternatively, as in the case with any crime, you can contact the free and anonymous Crimestoppers line on 0800 555 111 where mobile phone tariffs may apply.